Backing up all your apps on Android is still an arduous task, but that’s where the Robin hopes to help. It’s a partially crowdfunded smartphone from Nextbit, a company founded by former Android and HTC alums, and its entire goal is to make backing up your applications and photos seamless enough that you don’t even think about it. For the most part, the Robin succeeds at backing up your data, but Nextbit still has a bit of work to do before its Android smartphone is just as preened and polished as those it competes with. And whether that’s worth your $400 will depend on how you also feel wielding a smartphone that’s still sort of in beta. The Nextbit Robin looks unlike any smartphone you’ve seen before. The Robin has an appearance quite unlike any other Android phone. It sports a seriously cool look in a sort of cute and urban, Kid Robot kind of way. I received countless comments about its design from friends, family, and passersby. A few of my Windows Phone-loving pals even offered a crack about how its design resembles an evolved Nokia Lumia. The Robin has two small volume buttons on the left side that make a cute “clickety” sound when you press them. The Robin is one of the few devices available with USB Type-C. It supports USB 3.0 and Fast Charging, too. The Robin also has a small trail of LED indicator lights on the back so you can more easily visualize how much space you have left in the cloud. From the circular speaker grills on the front to the tiny LED light residing next to the charging port, you can tell that Nextbit’s industrial design team paid great attention to even the most minor details of the Robin’s chassis. The volume buttons on the left side of the phone make a “clickety” sound, and the power button in the right side features an embedded fingerprint scanner. Left-handers might find it sort of awkward to scan in with an index or middle finger, but I liked being able to unlock the phone from the same button that turns on the screen. The fingerprint scanner is super fast, but you’ll have to press the power button and then scan in your finger for it to work, versus a one-touch unlock like the Nexus 6P. The Robin’s fingerprint scanner is embedded into the power button on the right-hand side. I know the Robin looks like it’s sort of painful to hold with its angular edges, but it’s not. The phone is actually really comfortable to type on with both thumbs, and it’s thin enough so that it doesn’t bulk up your pocket. Its 1080p, 5.2-inch IPS LCD display is a good size for reading, too, though I quickly discovered that the Robin’s screen doesn’t get as dim as much as I would like for reading at night. The Robin is packed with 32GB of onboard storage, but since Nextbit hopes you’ll rely on the cloud backup feature integrated into the phone’s software, there is no expansion slot. Your least-used apps and photos will be synced to the cloud, where you have 100GB of space to play with. (We’ll get more into the logistics of how all this works a bit later.) The Robin also has NFC, so you’ll be able to use Android Pay, and it features dual front-facing speakers with amplifiers. I was impressed with the sound quality of these tiny speakers, though you’ll definitely notice the phone straining to keep up if you’re bumping anything with too much bass. The Robin’s Snapdragon 808 processor is perfectly capable at mobile gaming. Like the LG G4, the Nextbit Robin runs on a Snapdragon 808 processor with 3GB of RAM. The combination is enough to ensure that the interface runs smoothly and apps load relatively quickly. The Robin is perfectly capable of gaming, too; a 1080p display doesn’t strain a Snapdragon 808’s GPU too much. It doesn’t get scalding hot like other phones with similar specs, either, even if it’s plugged in while you’re playing a game. The Robin soared against phones with similar specs, like the Moto X Pure Edition. It was also relatively consistent when we benchmarked it for typical workflow, like browsing the web and editing photos. I tested the Robin against similarly-priced smartphones, including the HTC One A9 and Moto X Pure Edition, as well as the cheaper, low-end OnePlus X. Performance wise, the Robin is a pretty safe bet, though you’ll see a different story in its battery benchmarks. The Robin was a bit disappointing in our battery tests, though. This is where the phone let me down. The Robin appeared to be relatively energy efficient on standby, likely because of Marshmallow’s built-in Doze mode, but it fared differently in our battery benchmarks. The 2650mAh battery pack lasted four hours and 51 minutes in PCMark, and three hours and 33 minutes in Geekbench, with the display calibrated to 200 nits. It managed outperformed the Moto X Pure Edition and its 3000mAh battery, but it fell behind other devices with similar-sized battery packs, like the Samsung Galaxy S6. The Robin’s 13-megapixel rear-facing camera is pretty good, even though it’s lacking some basic functionality. The Robin’s 13-megapixel rear-facing camera sensor is plenty enough for pointing and shooting, but it lacks some essential camera features. There’s a manual mode, but it’s severely limited, as you can only adjust the exposure, ISO, white balance, or focal point. The Robin doesn’t offer a panoramic mode, either (at least not yet—Nextbit said that’s coming in a software update), and while the HDR feature is plenty capable, it’s painfully slow. There’s also an integrated burst mode you can activate by holding down the shutter button, but it’s only available when HDR is off. At the very least, the camera software is simple enough for anyone to use, but it’s not like there are enough features available to clog up the interface in the first place. The Nextbit Robin took some really impressive photos. Photos came out relatively clear, though a bit faded in some lighting situations. The Robin’s camera works well as a point-and-shoot device. The rear-facing camera is pretty capable in low light, too. Fortunately, what the Robin’s camera lacks in features, it makes up in photo quality. It scored well in our lab tests, and its low light abilities outperformed both the One Plus X and HTC One A9. I’m concerned about the Robin’s ability to focus in low light, however. When I took it out one night to shoot photos at a local show, I had to constantly tap the screen to refocus. Below is a video sample shot with the Robin in 1080p. The Robin doesn’t offer a ton of sophisticated camera features, but it does get the job done. I was pleased with the photos it took, enough to use it as my primary “play camera” for Instagram and Snapchat (the fact that it backs up all those photos to the cloud is a great incentive to do so, too). Still, it’s obvious that there’s more work to be done with the camera software. I’m hoping that we’ll see more refinement in a future software update. The Nextbit Robin is all about the cloud, and ensuring that you never worry about running out of space. It took me some time to fully grasp the concept, considering I’ve never managed to fill my phone to the brim. But then again, I never really tried. Nextbit’s Smart storage really knows what it’s doing. I spent an entire day stuffing the Robin full of applications, photos, music, and anything else I could find in an attempt to fill it to capacity—all 32GB of it. 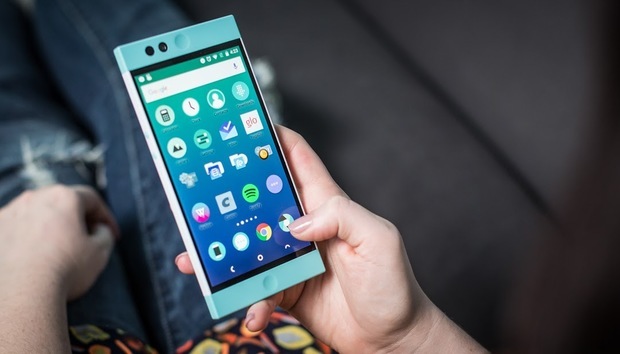 I eventually force-activated the Robin’s Smart storage, and it began offloading apps—that is, backing them up to my Nextbit cloud account, along with any data associated with them—to make room for new ones. It prioritized any apps that I hadn’t yet launched. Once they were offloaded to the cloud, any Google Play apps I had in the queue started downloading, as if that space had been available the entire time. The best part is that I did virtually nothing—the OS figured it all out for me! To restore an app, you simply tap on the grayed out icon. If you decide that, down the line, there’s an app that deserves that space back on your Home screen, you can tap on the grayed out icon to restore it. This will also bring back data like your account information or a saved state in a game, though I haven’t had enough time with the phone to experience how this works. And if there’s an app you absolutely can’t live without, you can pin it by swiping down on the icon so that it never gets offloaded to the cloud. Nextbit’s Smart storage settings are easy to set up, too. By default, all your data is backed up via Wi-Fi and only while the phone is plugged in, so you won’t incur any mobile data charges without your consent. You can also choose whether to backup your photos, where the Robin archives them in the cloud and then uses a low-resolution thumbnail as a placeholder in the Gallery app. I like having Smart storage enabled. In a way, it solves a pain point for Android that we’ve been waiting for Google to implement for some time—the backup feature on Marshmallow is paltry by comparison, and it usually doesn’t even save the app state. However, Nextbit’s solution still needs a little work. For one, I have no idea what is backed up and what isn’t, and two, it’d be nice to see detailed readouts for each backed-up app, like stats on when it was last backed up and how much cloud space it’s using up. Nextbit’s Android interface is bright and cool, but it’s lacking an application drawer. Nextbit initially said it would ship its phone with Android 5.1.1, but thankfully the Robin is already on 6.0. The interface is like stock Android, though with a huge glaring difference: There’s no application drawer. This results in a messy-looking Home screen. Cluttered home screens full of all your apps is one of the shortcomings of iOS, and it’s a shame to see it foisted on Android users. I personally like to have the option for a barren Home screen with all the apps I hardly use stowed away in the drawer. The Robin’s widget menu is a little too OS X-like for me, though I appreciate the concept of a clean, widget-only screen. Nextbit also changed the way widgets work on its version of Android. They’re only accessible via a Mac OS X Dashboard-like overlay screen that you bring up by pinching from both sides the screen. I’m not a fan of this interface tweak because I rely on widgets to quickly display relevant information, and I like them placed next to my icons on the Home screen. Thankfully, you can load your own launcher if you don’t like what Nextbit offers, and the Robin’s Smart storage abilities will still work in the background. I’ve been reviewing smartphones for several years now and have had my fill of manufacturers overpromising and underdelivering, I figured Nextbit would be another one of those startups making a big fuss over a product that would eventually end up rather lackluster, but thankfully that’s not the case here. The Robin fulfills its duty in attempting to solve an issue that every smartphone user has, which is that your device has a finite amount of storage. When you’ve hit that storage cap, the Robin takes over the hard job of figuring out what should be tossed out. The feature is really promising from what I’ve experienced so far. There are still kinks to be worked out with the Robin, though. It may be a stylish, one-of-a-kind looking smartphone, but its camera software trails behind that of its competitors (even the low-end Moto E has more camera options than the Robin). Also, I would have liked to see more granular controls for its backup abilities, because it feels like I’m blindly relying on this relatively unknown company to back up my stuff without knowing exactly what’s going on up there in the cloud. The Nextbit Robin still feels very “beta,” so you’ll have to do some soul searching about whether or not you’re willing to to stick it out with a startup. If you do, you’ll be holding on to a smartphone that’s truly innovative, which is something the world of Android desperately needs. « Supply chains: Danger ahead!